Roof Restoration: Why Should I Restore My Aged Roof? There are several reasons why roof restoration is not only the BEST CHOICE but should be the ONLY CHOICE. These systems provide cost savings, lengthen roof life, excellent waterproofing, durability, strength, reflectivity, energy efficiency and more! They are environmentally friendly and sustainable, meaning the AcryPly® Roof Restoration Systems can be renewed, allowing you to avoid a costly and timely traditional roof tear-off indefinitely. Roof failures and leaks are the number one reason a person replaces their roof. Using the AcryPly Roof Restoration System you receive a custom installed, seamless roofing membrane that is spray applied directly on top of your existing roof, coating and sealing all the different elements your particular roof possesses - equipment, hatches, pipes, skylights, penetrations, etc.. in a single, monolithic membrane that can expand and contract with temperature changes without splitting, ripping, tearing or cracking at seams (since there are none!). You receive a roofing system that providing excellent waterproofing that has been proven over 33 years and has been installed on hundreds of millions of square feet of commercial buildings! Check out our Case Histories for more information. 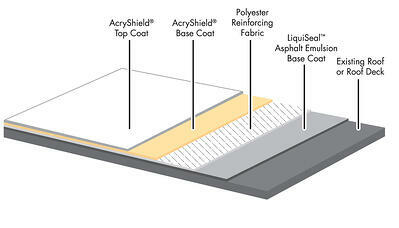 Roof restoration systems avoid costly roof replacement. This means shorter installation phases, no landfill fee's, and businesses can remain open, conducting business as usual since theses systems are non-disruptive (spray applied, no drilling, nailing, seam-welding, or harsh odors). These systems reduce roof maintenance, with superior UV protection, the roof coatings protect your rooftop from the harsh and damaging UV rays from the sun. Most people do not realize, but the sun is your rooftops worse enemy, causing the most degradation and damage. Therefore, it is vital to have an excellent UV protectant! Roof life is lengthen - with reduced roof maintenance and added UV protection, you save money as your roof lasts longer. Sustainable! Our AcryPly Roof Restoration Systems can be renewed every 10 or so years to gain a fully durable, brand new rooftop, with renewed reflectivity and waterproofing capabilities. When properly sustained, these roofing systems will never have to be replaced or torn off. This allows you re-use existing roofing material and elevated already congested landfills. ZERO VOC's or Ultra Low VOC's - Many of our roof coatings contain zero Volatile Organic Content (VOC) which are harmful to people and the environment. Download our Full Line Product Brochure for even more information on Benefits Regarding AcryShield Roof Coatings and AcryPly Roof Restoration System! Does your building require special installation requirements such as a clean room environment or a facility that is open 24 hours a day, 7 days a week and you are unsure how to solve your roof repair with those circumstances? Roof coating systems provide an excellent solution for these situations and others that are similar. Many businesses operate in environments that cannot be disrupted during installation. Installing one of our AcryPly or AcryShield roof coating systems not only provides a fully adhered, seamless, watertight membrane, but this system is spray applied meaning there is no nailing, drilling or screwing required. This ensures minimal noise disruption and no dust or debris to come loose inside the building. TriVascular Inc installed one of NCC’s roof coating systems to their clean room facility and they were extremely satisfied with the outcome. TriVascular is a medical device manufacturer that operates in a clean room environment. It would cost them up to $100K per day to shut down their operation and if any dust, debris or water enters the room, it would compromise the sterile environment requiring a four-day re-certify before operations could continue. This extremely sensitive situation was still able receive a new roof coating system without shutting down or compromising their facility. For more on this case history read “Unique Roof Coating Sistuation – Clean Room Case History”. Kaiser Permanente has been another company that requires absolutely no disruptions or closures during installation. Their medical centers are open 24 hours a day, 7 days a week and are unable to shut down for a week or so to install a new roof. The AcryShiled SPF Roofing System was successfully installed on their South Bay Medical Center without disruption operations or their patients. Kaiser was provided with a 20-year warranty to their newly insulated and sound dampening watertight roofing system. Click here to read the “Kaiser Permanente Case History”. The Arden Fair Mall is another company that had a severely aged and leaking roof that required extensive roof repair but could not afford to disrupt operations or close during installation. This 255,000 square foot mall needed a new roof while avoiding a costly tear off. Retail operations could not experience loud noises, debris from over head or any distractions to occupants and mall patrons. They received the AcryPly Roof Restoration System, which provided an extremely durable, waterproof roofing system with substantial energy savings all while the mall conducted business as usual. For more on this case study, read “Arden Fair Mall Case History”. Download our Full Line Brochure for more information!